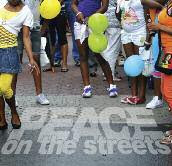 Peace Week in Lambeth runs from 19 to 26 September. Throughout the week there will be events to help address issues that affect us all. Lambeth is the fourth most densely populated council area in the country with a population of over 270,000 that speak between them over 130 languages in their homes. It is a diverse community and highly mobile. Our neighbourhoods and communities are ever changing as members of very different communities choose to make Lambeth their home be it for a short time or longer. The resulting diversity is rightly noted and celebrated. Peace Week in Lambeth has been designed to bring our communities together, celebrate our differences and work together to address issues which affect us all. In particular, we know that tackling anxieties linked to actual and perceived crime are of priority for everyone. You are invited to join any of the events. Bring along your family members, friends and neighbours and meet up with people who are delivering initiatives which help bring communities together and make Lambeth a safer borough. On Saturday 26th September there will be a drop in Police Surgery for Spanish and Portuguese communities at the Wyvil School on South Lambeth Road from 12 noon to 3pm. From 12 noon to 6pm there will be a Safer Communities Zone at the Stockwell Festival in Larkhall Park. • the Safer Communities Zone at Stockwell's Expo.